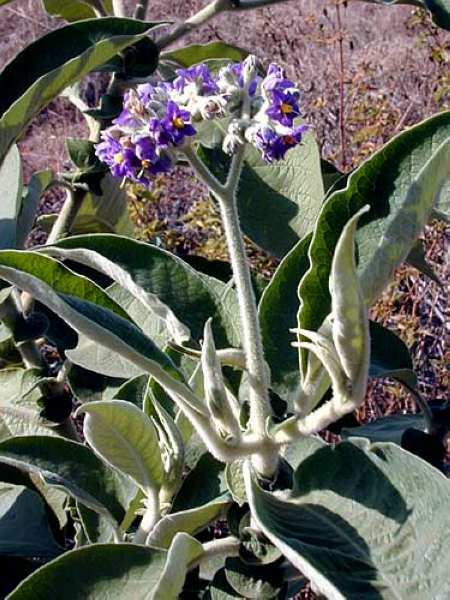 Solanum mauritianum is a widespread invasive weed belonging to the nightshade family. It has the ability to crowd out native plants if growing densely, but, if occurring sparsely, it may act as a nursery crop. 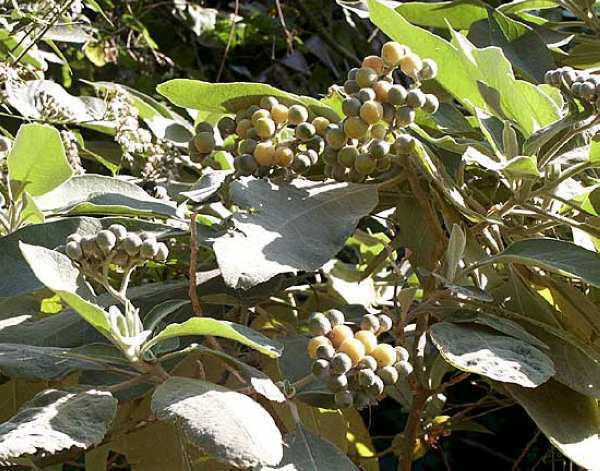 All parts of Solanum mauritianum plant are poisonous to humans, especially the berries. 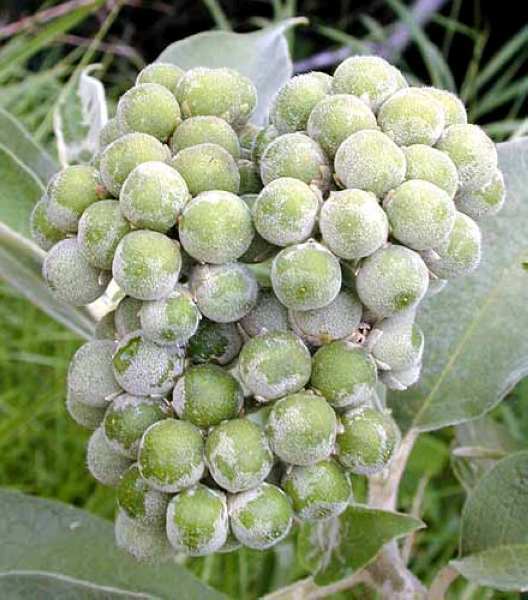 This plant is dispersed by birds, with the fruit being especially favoured by some species. Biological control of this species has been undertaken in South Africa. \"Shrubs or small trees 2-10m tall, branched above to form a rounded canopy, unarmed, all parts densely pubescent with\nsessile to long-stalked stellate hairs, loose and floccose on young growth. 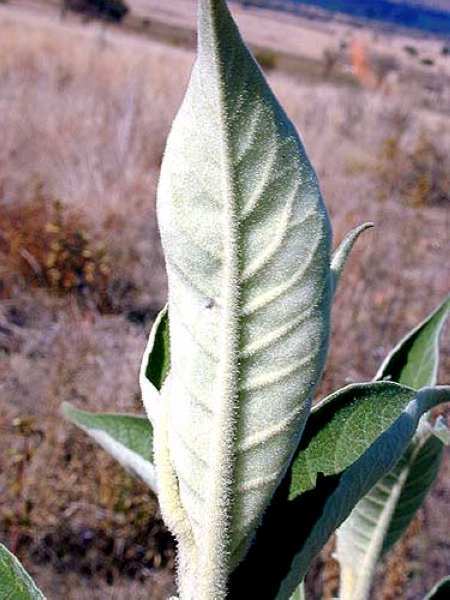 Leaves paler on lower surface, simple, alternate, elliptic, up to0 cm long and 12cm wide on young vigorous growth, usually ca 8 cm long and ca 7cm wide, on mature stems. When crushed they give off a smell of diesel fuel. Margins entire, apex acuminate, base cuneate, often oblique, petioles 3-9cm long, each with 1-2 smaller auriculate leaves in axils, these sessile, rounded, sometime absent from weak or distal shoots. Flowers perfect, actinomorphic, numerous in branched corymbs, peduncles up to 15cm long to first fork, pedicels 2-3mm long; calyx tube short, 2-3mm long, the lobes narrowly triangular, 2-3mm long; corolla lilac blue with a pale star-shaped area at base, stellate, 1.5-2.5cm in diameter; stamens 5, inserted low on corolla tube; filaments ca 1mm long; anthers oblong, 2-3.5mm long, opening by terminal pores; ovary densely pubescent; style pubescent in lower part, 5-7mm long; stigma green, terminal. Berries green, ripening to dull yellow, succulent, globose, 1-1.5cm in diameter, pubescent at least in early stages. Seeds numerous, flattened, 1.5-2mm long, testa minutely reticulate. Self-compatible .\"\" (Wagner et al., 1999, in PIER, 2002)\"
Flowers and fruits all year round (Wildy, 2002). Germination of seeds stored in soil is stimulated by fire (ESC, 2003). Seedlings that become established in summer can flower by autumn. Plants can grow to a height of several metres within 2-3 years. Mature plants begin to die after 15 years (Haley, 1997). Can be used as a nursery crop in countries where it is less invasive than elsewhere (e.g. Australia). This is because it can provide a protective environment for native vegetation to germinate and grow underneath. This is dependent on the situation though, as it will not be effective if S. mauritianum is so thick that it shades out plants growing beneath it. The fruit may be a valuable food source for native bird species, although these tend to facilitate long-distance dispersal and further invasion (CGC, 2003; T. Olckers, pers. comm.). In Hawai‘i, naturalized on slopes and ridges in disturbed wet forest (Wagner et. al. 1999 in PIER, 2002). A coloniser of disturbed sites (KZN Wildlife). 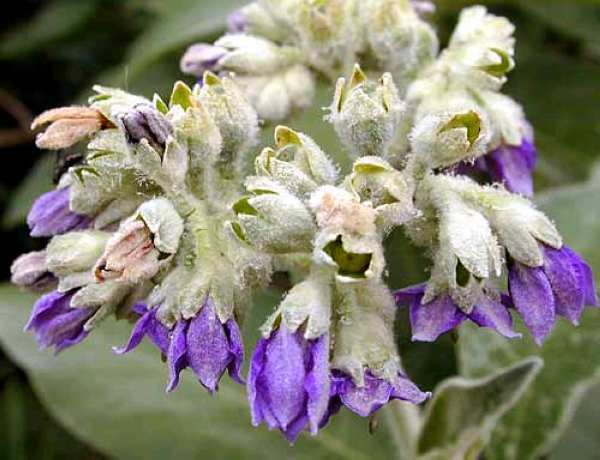 Tolerates various soil types and is shade-tolerant to a certain degree (Haley, 1997). 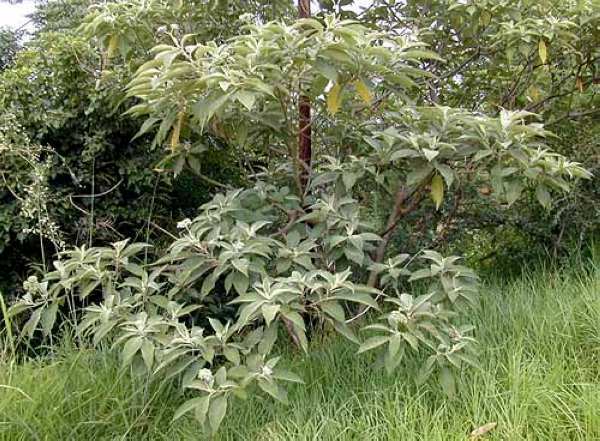 In South Africa, the plant invades riparian zones, forestry plantations, natural forest, agricultural lands, urban open space and any other disturbed areas (e.g. along roadsides, powerlines etc. ), particularly in the eastern, higher rainfall regions of the country (Henderson, 2001). Seed. Some 20-80 berries are borne on each inflorescence, each of which contains about 150 seeds (T. Olckers, pers. comm.). Review: Dr. Terry Olckers, ARC - Plant Protection Research Institute, South Africa. 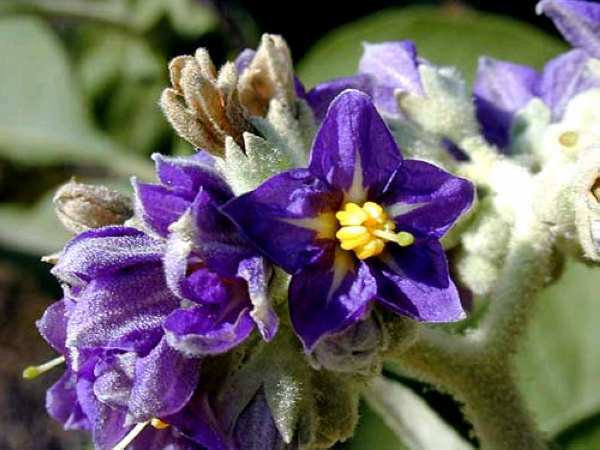 Recommended citation: Global Invasive Species Database (2019) Species profile: Solanum mauritianum. Downloaded from http://www.iucngisd.org/gisd/species.php?sc=209 on 21-04-2019. Can invade urban areas, native forest margins and pastoral land. May form dense stands that inhibit the growth of other species through overcrowding and shading (Haley, 1997). Can retard the growth of young pine trees (Pinus spp.) (Wildy, 2002). 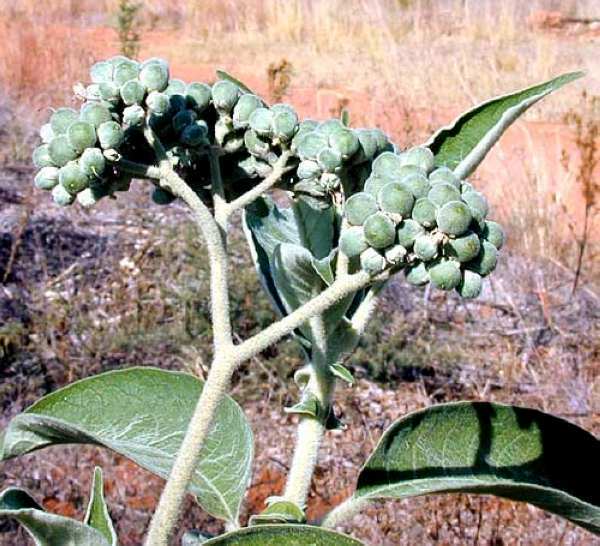 All parts of the plant are poisonous to humans, especially the green berries (ESC, 2003). These berries also provide winter food for the Mediterranean and KwaZulu-Natal fruit flies, which are horticultural pests. The fine hairs on the leaves can be an irritant, especially when they are dislodged during removal operations (Wildy, 2002). Chemical: Easily killed with herbicides. In South Africa, several chemicals (e.g. glyphosate, triclopyr, imazapyr) are registered as foliar, basal stem or cut stump applications. Manual control involves ring-barking trees or removing seedlings by hand (Wildy, 2002). \r\nBiological: Biological control has been instituted in South Africa, with the release of a sap-sucking lace bug (Gargaphia decoris) in 1999 (Olckers, 1999, 2000). However, this insect has proved ineffective to date. Permission for the release of the flowerbud weevil (Anthonomus santacruzi) that prevents fruiting is currently being sought in South Africa (T. Olckers, pers. comm.). Informations on Solanum mauritianum has been recorded for the following locations. Click on the name for additional informations. Agricultural Research Council, 2002. The Bugweed Lace Bug. Agricultural Research Council, South Africa. Summary: A useful one-page document with information on Gargaphia decoris, a biological control agent for S. mauritianum. Contains contact details for further information. Available from: http://www-dwaf.pwv.gov.za/wfw/Control/BioDossiers/04.%20Bugweed%20lace%20bug.pdf [Accessed 22 November 2002]. Haley, N. 1997. Solanum mauritianum webpage. Environment B.O.P. (Bay of Plenty). Summary: Contains information on identification, habitat, impacts and dispersal, as well as a tiny amount on management. Contains a broken link to an excellent fact sheet on chemical control. Summary: A short article on biological control of Solanum mauritianum in South Africa. Available from: http://www.landcareresearch.co.nz/publications/newsletters/weeds/wtsnew17.pdf [Accessed 7 April 2003]. Mather, J. 1998. Fact Sheet PP01/98, Environment B.O.P (Bay of Plenty). McGregor, P.G. 1999. Prospects for biological control of woolly nightshade, Solanum mauritianum (Solanaceae: Solanoideae). Landcare Research Contract Report: LC9900/035. 15 pp. Summary: An unpublished report which outlines the status, current control options and prospects for biological control of S. mauritianum in New Zealand. Summary: A paper outlining the evaluation process for a potential biological control agent in South Africa. This particular species was determined to be unsuitable for release in South Africa. Olckers, T. 1999. 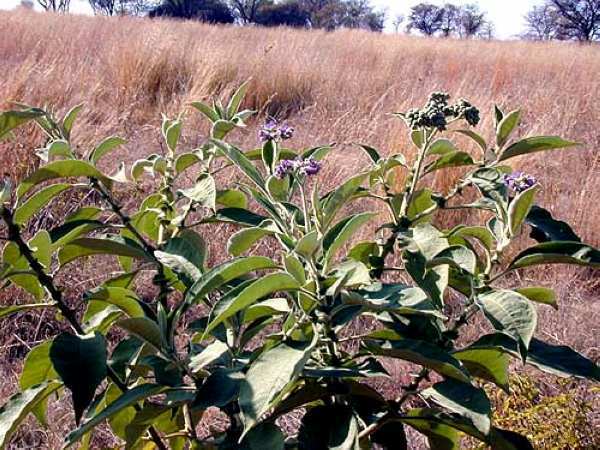 Biological control of Solanum mauritianum Scopoli (Solanaceae) in South Africa: a review of candidate agents, progress and future prospects. African Entomology Memoir No. 1: 65-73. Summary: A paper which reviews the biological control programme launched against S. mauritianum in South Africa and the prospects for success. Olckers, T. 2000. Biology, host specificity and risk assessment of Gargaphia decoris, the first agent to be released in South Africa for the biological control of the invasive tree Solanum mauritianum. BioControl 45: 373-388. Summary: A paper outlining the evaluation process for a potential biological control agent in South Africa. This particular species was determined to be suitable for release in South Africa and was subsequently released in 1999. PIER (Pacific Island Ecosystems at Risk), 2002. Solanum mauritianum. Withers, T.M., Olckers, T. & S.V. Fowler. 2002. The risk to Solanum spp. in New Zealand from Gargaphia decoris (Hem. : Tingidae), a potential biocontrol agent against woolly nightshade, S.mauritianum New Zealand Plant Protection 55: 90-94. Summary: A paper outlining the prospects for obtaining permission to release Gargaphia decoris for the biological control of S.mauritianum in New Zealand. Agricultural Research Council. S. mauritianum. An illustrated guide to selected alien invasive plants in South Africa � National Department of Agriculture & Agricultural Research Council, South Africa. Summary: Good images, limited information. Available from: http://www.ru.ac.za/institutes/rgi/mark/weeds/solmau.htm [Accessed 18 November 2002]. Atlas of Florida Vascular Plants, 2002. Institute for Systematic Botany. Summary: Synonyms of the plant. 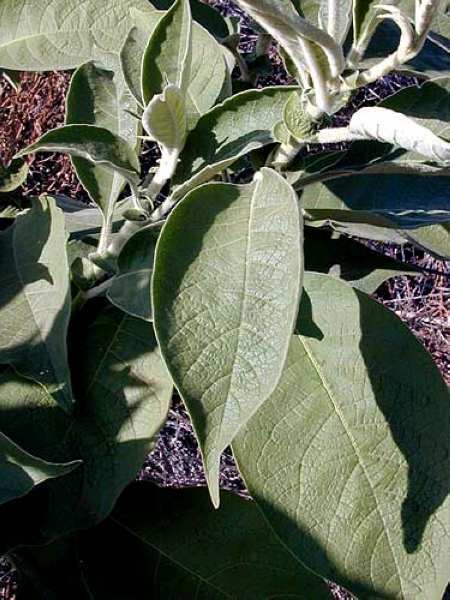 Available from: http://www.plantatlas.usf.edu/main.asp?plantID=258 [Accessed 18 November 2002]. CGC (Community Greening Centre), 2003. Newcastle City Council. Summary: A small amount of information about the use of Solanum mauritianum as a nursery plant. Available from: http://www.newcastle.nsw.gov.au/services/environment/greening/plants.cfm?inc=wild_tobacco [Accessed 14 May 2003]. Eurobodalla Shire Council (ESC), 2003, South Coast Weeds. Henderson, L. 2001. Alien Weeds and Invasive Plants: A Complete Guide to Declared Weeds and Invaders in South Africa. Plant Protection Research Institute Handbook No. 12. 300 pp. Summary: A handbook which provides a short description of S. mauritianum and a map of its distribution in South Africa (p. 195). Kissmann, K.G. & D. Groth. 1997. Plantas Infestantes e Nocivas. Tomo 3, 2 Edicao. BASF, Sao Paulo, Brasil. Summary: A book which provides more detailed botanical information on S. mauritianum in its native Brazil (pp. 551-554). Also covered are the closely related species, S. erianthum (pp. 527-530; probably a synonym) and S. granuloso-leprosum (pp. 541-543). KZN Wildlife. Wildlife management: alien plant invaders and their control. Ezemvelo KZN Wildlife, South Africa. Summary: Has one paragraph on S. mauritianum. Scant information. Lorenzi, H. 1991. Plantas Daninhas do Brasil: terrestres, aquaticas, parasitas, toxicas e medicinais (Segunda Edicao). Editora Plantarum, Nova Odessa. Summary: A book which provides a short description of S. mauritianum (listed as S. erianthum) and a map of its distribution in its native Brazil (p. 391). Wildy, E. 2002. Alien Invader Plants. Wildlife & Environment Society of South Africa (WESSA). Summary: Contains images, and a small amount of material on description, impacts and distribution. The most useful information covers chemical control methods, which details herbicides to use and where they should be applied. Available from: http://www.geocities.com/wessaaliens/species/bugweed.htm [Accessed 18 November 2002].